A unique and versatile talent, Stephen Dorrington is adept at belting out a rock cover, crooning his own original work or appearing on the musical stage. 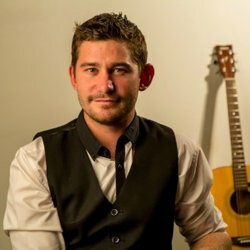 A QLD based singer, songwriter, actor and musician, his range and experience spans corporate entertainment, theatre, as well as pub and club engagements. Stephen trained in guitar, voice and dance from the age of 4, when music and performance became a clear passion and lifelong pursuit. On stage theatrical credits include: Cats (Munkustrap), Spamalot (Prince Herbert), Wizard of Oz (Tin Man), Sound of music, (Rolf) , Chess (Arbiter), and The Full Monty (Jerry) – this performance receiving a ‘Best Actor’ nomination at the GC Theatre Awards. Stephens’s distinctive rock/folk voice is a common favourite around Brisbane and the Gold Coast. His original song writing has seen him recently collaborate with jazz great James Morrison. He also regularly writes original work for Australia’s best cabaret artists. His songs have been featured on radio 4ZZZ. Stephen recently played the lead role of ‘Rob’ in Logan’s under this sky leading a cast of 700 in front of audiences of 15,000. Stephen and his rock band are heading into Airlock studios to record their Debut EP in December. Let Me Know is a 60's style surf rock inspired piece. The guitar hook will leave a lasting imprint on your subconscious. Its smooth half time versus create space and ambience in contrast to the ferocity of the chorus. The bridge is epic, complete with the standard rock money note.